From this console you can issue any command to the Minecraft server. The most important one you should know is the command to safely stop the server. This will save all players and states which is simply “stop” without the quotes. To get out of the console without closing the server press Ctrl+A and then Ctrl+D. This will minimize the screen session and put you back in your main console session. The screen session will continue to run even if you disconnect from your SSH session to your Pi! The most important optimization you can make is high performance storage. Read my Raspberry Pi Storage Benchmarks article to see why some storage mediums are over 1000% faster for I/O which is the most critical factor for a Raspberry Pi Minecraft server. You can also use USB adapters for mSATA SSDs (cheap on eBay) or a USB to SATA cable if you have a 2.5″ older SSD. That’s it! If your Pi won’t boot up after doing the SD card overclock don’t panic. Just put the SD card in any computer and remove the line dtparam=sd_overclock=100 from boot.txt. You can do it from Windows using notepad or any other text editor on any OS as the boot partition is always visible. If you are using a older Raspberry Pi or a Raspberry Pi Zero then you may want to overclock it as well for smooth performance in game. My favorite guide for overclocking older Raspberry Pis is located at the one and only RetroPie project wiki page located here. The CPU and memory overclocking is going to be the most beneficial. If you are using an older Pi or have more than a few players using the server you may need to do some optimizations. 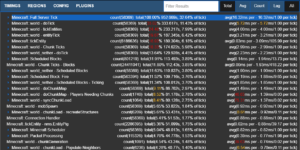 The most important thing to understand about optimizing your Minecraft server is to understand what is slowing it down. There is an extremely useful tool built into the Paper Minecraft server called timings. In the intro to this post I posted a picture of the graphs from this report. This will give a link to paste in a web browser to view an incredibly detailed report. There are several different views available. It is important not to look only at the “Lag” category but also view the “All” category. If you only look at “Lag” you’re only seeing part of the picture. This is useful for identifying major “spikey” slowdowns but not the overall performance of the server. Check the “All” tab and toggle between total, average and count to understand how your server is performing. In this example we can see some of the more expensive operations on my server are entities and chunks. Entities are monsters/animals/items/villagers/etc. Chunks are the map itself. If you are doing heavy exploring on a new server you may see very large numbers for chunks. This is due to the Pi generating them and storing them on the SD card (slow). If you are spending lots of time in villages or fighting monsters the entities may be high. Check config files – Configuration files are server.properties, paper.yml, spigot.yml, and bukkit.yml. If unsure about what a setting does google it or consult the documentation. If you screw up your configuration unintentionally then you can revert it to default by removing the file and relaunching the server. Lower your entity counts/ranges – Type nano bukkit.yml and in the file you will find spawn-limits: monsters: 70 animals: 15 and several others. You may lower these numbers to limit the number of entities by type. Type nano spigot.yml and you will find entity-activation-range and entity-tracking-range. These control how close you have to be before the server starts making monsters see/track you. Disable the Nether and The End – In server.properties. In the sample report you will see the Nether uses CPU cycles (we never went there). When/if your group is ready to go to the Nether you can turn it back on in the properties to re-enable it. You may disable “The End” in bukkit.yml by setting allow-end: false. Lower the view distance – This should be a last resort but on older Pi hardware or if you want more than a handful of players this is an option. It will increase performance dramatically because it reduces chunk loading/generation. Since chunk loading/unloading/generation is very I/O intensive the Pi is not very good at it. Change it in server.properties and spigot.yml. Thanks for the tutorial ! The controls works on Asus Tinker Board? And 16GB SD is enough for the minecraft server and the bone? Absolutely. I haven’t picked up an ASUS Tinker Board yet but as long as they have a java9 or java8 JDK package it should work just fine. 16GB is also plenty of memory! What would you recommend for the max number of players for the Raspberry Pi 3 B+? I currently just have the Raspberry Pi 3 and I have the max players set for 8 with seems to work quite well. I was wanting to upgrade it to the B+. I have heard of people getting 12 players on there quite comfortably on the 3B+. I would start there and slowly add and see how the server is running. Definitely monitor the timings and see if you are having any problematic areas on the server that may be leading up to lag. I’d recommend around 700-800MB. This leaves room for the base services on the Pi to still run. If you push the base services into the swap it can cause the Pi to crash or slow down dramatically. If you disable some services on the Pi it can definitely free up a small amount of room to squeeze out a little more but 800MB is pretty sufficient. You can experiment with higher and see if the Pi can handle it but I’d start at 700 and work up from there. how can i make /minecraft/start.sh start on boot? The best way is using a system service as a daemon. I will make a post on how to do this as I have been creating daemons for other things I have been working on. Make sure that you have the server closed when you are trying to copy your world over and then start the server afterward. The server creates a session.lock file when it is running. so if the world won’t run can I delete the session.lock and run the server and it will work? Yes. If you are certain that the server is closed and there is a stale session.lock file then it should be safe to delete it and start the server. Check out this link from the Minecraft wiki about session.lock. It is meant to make sure that the last program the accessed the world continues to be the only program that can access it. Since you are moving the server over, this behavior is not desired and it is safe to delete the session.lock. When the server runs it will create a new one saying your Pi server now owns the world. If you transferred the world again in the future back to a different platform you would delete the session.lock again to release the world. If you have further trouble you can chmod 777 world or session.lock. See this answer if just sudo rm session.lock inside the world folder doesn’t work for you. Thanks for this post, it is the most comprehensive tutorial I have found about creating a minecraft server on rbpi 3. Sorry about the lack of clarification there. I will update that section to clarify. You are correct in that I am suggesting using a solid state based flash drive over a MicroSD card. Check out this article to see why. In a nutshell, solid state with the Pi outperforms even the most expensive MicroSD cards by a huge margin. Even cheap based makeshift drives (also described in linked article) maxed out the bus in a way that MicroSD can’t. Since Minecraft is very I/O intensive with constant chunk generation and loading having fast storage is critical for good performance. I note the aquatic version 1.13-pre1 version is available, can you advise how to upgrade? The Paper server project is built on top of Spigot which has had a 1.13 server up for testing publicly for months now. I expect support for 1.13-pre1 to come to Paper very soon. I got the fast 32 GB SD card and followed the directions. I get the Pi to launch but I can’t connect. I “think” I have port forwarding correctly setup on my router. The question that hits is how do I know? How do I check? I don’t know if it is my work or a version incompatibility with Minecraft on my family’s iPads and my laptop. Any thoughts would be appreciated. It sounds like you are using the Minecraft Bedrock edition (which is the one that comes with Windows and the available version for iPad). This server is for the Java edition available at Mojang.com. Thank you for all your work and sharing, my kids will go crazy now. Great guide here as well. I have the exact same setup with the SanDisk Extreme Pro USB Flash Drive and it works well most of the time! I am however getting really random performance dips where the server will have a consistent 4-6 second lag that last anywhere from a minute to several hours. I’ve tested the server with just myself and upwards of 7 people now and regardless of the number of players the performance variation remains. We’re all loving it, but I’d really be happy if I could squash out these hiccups and get a nice smooth sailing experience. I just wanted to know what kind of optimizations you’ve done outside of what’s written in your post? I am using just the regular server.jar that mojang has to download and not the paperclip, so I don’t have the spiggot or bukkit configuration files. I tried using paperclip for a period of time but it was just giving some of the same issues. I make sure to utilize some java flags like setting the memory usage to 800M. I have skepticism about thermal throttling of the R.pi, mine get’s pretty hot. I have heatsinks on the two main chips but that’s about it. I also wonder if it could maybe be a networking thing? However, whenever I host the server with the same settings on a stronger desktop on the same network I’m seeing the issues go away. Did you tweak anything in either of these areas to optimize performance? Would love to hear what you have to say, keeping the R.pi as a permanent server setup is a dream! The main things outside my original post depend on what kind of server you are running and what you want to do. The most important thing to do first is figure out what is slowing down the server. 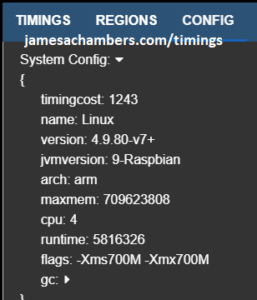 Have you ran the timings tool on the server to determine where the spikes are and what the server is doing when they occur? Some examples of optimizations I’d do: monster/animal view and action distance can be lowered in a lot of situations, lowering the view distance in the game can help with block chunking I/O issues, pregenerating the map in MCEdit can help if block reads/saves are slowing you down, reducing save timers can help if it’s getting stuck while autosaving various parts of the game by making them less frequent, etc. I could definitely assist if you posted a link to your timing results. Have you taken measurements as to what temperature your Pi is reporting? In this article I used a Pi 3B+ which came with the little heatsinks installed and didn’t do any additional tweaks regarding heat. If you’re running without the heatsinks this is where I would start. A few degrees being pulled off the chips by the heatsink may make all the difference in stabilizing the board’s performance and they only cost around 5 bucks from Amazon for the whole kit (get one with good reviews, the super cheap ones don’t conduct very well). Although you aren’t running RetroPie on the box we may find via your temperature readings that you are hitting temperatures where you may need to provide some active cooling. This little fan powered by the RPI itself is pretty nifty but you can also just put a normal desk fan right over the Pi to pull heat off it (especially with the heatsink kits). I haven’t ran it on the Raspberry Pi yet but it looks like a native Ubuntu one is available. first of all thanks for sharing you knowledge and work! Especially with your script and detailled information you make it super easy for us guys. I appriciate that. Anyway, I run across two problems. Here’s my setup: Server is hostes on my RPi 2B+. Game is played on my RPi 3B+. First problem: The server installed with your script is 1.13.2 and I think at the moment 1.12.1 ist the latest running client on my Pi 3. I see two options. Option 1: Using your “outdated” manual installation guide to install an older server version. And since in the future I’ll have to wait for people to get the latest MC version running on the Pi, I guess that’s my best option to go for and not beeing dependent on scripts. Option 2: Simply getting the 1.13.2 MC client running on my Pi 3. Probably I can fix this problem by myself, but some tips are welcome. THE REAL PROBLEM: Shortly after starting the server and everything is loaded, I get a bunch of red error lines in the screen window. And even though it states that “THIS IS NOT A BUG OR A CRASH”, none of my friends are able to connect to the server. The error lines are like app//com.majong.datafixers…, java.base@9-Raspbian/java.util…, app//org.bukkit.craftbuild…, app//net.minecraft.server.v1_13_R2…, etc. I don’t even know what that means and by consequence how to fix it. Now to address the real problem section. A couple of things: Is this a brand new server or is this your 1.12 server now running on the 1.13 server? There are some version compatibility issues between the two. It would also help to see the full error message. There’s actually some useful info buried in the 20+ lines it spits out every time it has an error so pasting a full copy would help as well. From what you posted I see a DataFixer exception. The DataFixer class is the class that helps manage data between different Minecraft versions which would point to my original theory. If you go the 1.12.2 route then it would be best to load up a backup from before the 1.13 server ever touched it as moving forward is difficult enough and moving backward is impossible once 1.13.2 put its own data structures in there. Let me know what you think and if this is a new or existing server and paste in some samples of the full error and we should be able to get it straightened!